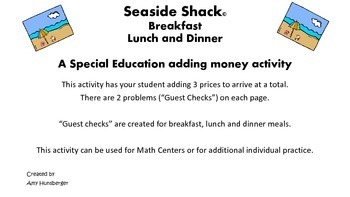 This activity has your student adding 3 prices to arrive at a total. There are 2 problems (“Guest Checks”) on each page. 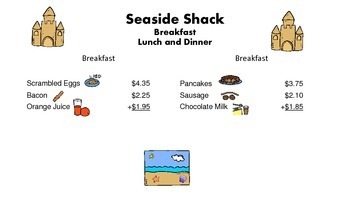 “Guest checks” are created for breakfast, lunch and dinner meals. 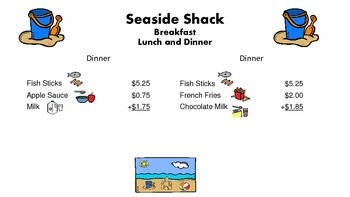 This activity can be used for Math Centers or for additional individual practice. 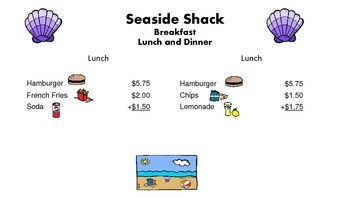 Minimal graphs and “white space” are provide to allow the student to focus on the dollar amounts and skills being practiced-using a calculator if needed, and adding a list of prices to arrive at a total.